The Island of Karpathos in Greece has a reputation for strong winds. 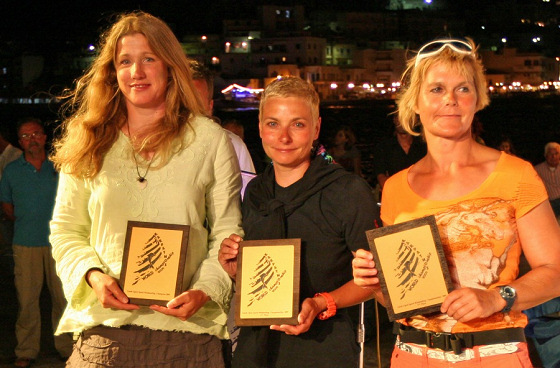 It delivered in spades for the recent Greek Speedsailing Open Championships. With winds of over 50 knots on the 1st day, I had a tough battle to win overall with a top speed of 34.65 knots. My closest rival Birgit Hofer from Germany gave me a real battle in the strong but gusty winds, which even made some of the men stay off the water. It was down to the final day and I had dropped to 2nd in the fluky conditions and needed two wins to secure the win which I managed with two 33.5 knot runs! This event was scheduled to run concurrently with the ISWC speed world Cup where the world champion will be crowned. This result we hope will bode well for me going into the worlds. With only one days rest wish me good luck.